Green tea benefits have been widely touted for centuries. This is because, as the least processed tea, yet the one that is the richest in antioxidants, the green tea benefits to overall health are astonishing. As one of the most popular tea varieties in the world, its potency is well-documented and its praise well-deserved. It is the epigallocatechin in green tea, also known as EGCG, which is considered to be one of the greatest combatants of cancerous cells, as the antioxidants found in these are 120% more powerful than the antioxidants found in vitamin C.
When comparing the nutritional benefits of different tea varieties, matcha green tea tends to stand out most for its high catechin polyphenol content, which is responsible for the elevated antioxidant activity in tea. This is perhaps due to its unique cultivating in which it is protected with a heavy cloth for several weeks prior to its May harvest. This covering allows shoots to grow larger, but thinner leaves, which also increases the flavor and texture of matcha green tea. Green tea fights cancer in a variety of ways, the most notable being with its high antioxidant properties. However, it also hinders the creation of new blood vessels, which cancer cells devour in order to garner nutrients needed to grow and reproduce. By reducing the creation of new blood vessels, green tea helps to effectively and literally starve cancer to death. Independent laboratory studies reveal that green tea benefits may actually serve to slow the production of cancerous cells, which may account for its overall effectiveness against this deadly disease. Also, because green tea contains caffeine, it can cause frequent urination, nausea, diarrhea, irritability, nervousness and insomnia. When taken in large doses, green tea may interfere with the effectiveness of anticoagulant drugs. Anyone who is on warfarin, or a similar anticoagulant, is advised to discuss the use of green tea in natural cures and home remedies with their health care provider first. Many diet companies advertise some form of green tea fat burner supplements. While limited studies do support green tea as a fat burner, along with exercise and other dietary changes, it is best to consume green tea in natural forms, instead of supplements, in order to get the full nutritional and health benefits it offers. 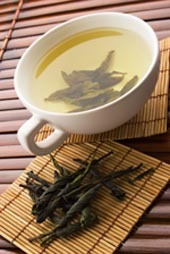 Occasionally, green tea side effects are discussed, which often stem from green tea supplements or extracts. Of the many types of tea, (which include white, black and red varieties), green tea is believed to be the most beneficial to good health. While herbal teas are often sold alongside other tea varieties, consumers should be aware that these are not real tea, but are actually herbal infusions made by other plants. While some may contain antioxidants and other nutritional benefits, they will not offer the same health-promoting green tea benefits.